Clark University sophomore Krissy Truesdale lives each day to make the world a cleaner, greener and friendlier place. Solar for Our Superheroes (S4OS), the nonprofit she formed as a 16-year-old, is how she hopes to accomplish that. Truesdale, a Traina Scholar who’s planning to major in global environmental studies, developed the initial idea for the nonprofit organization as a way of thanking local leaders such as veterans, teachers, firefighters and police officers for their service by providing free solar panels for their homes. Her goal was for S4OS to raise money to purchase the panels, help people save money each month and show the positive potential uses for renewable energy in Massachusetts. Her original plan changed slightly during the organization’s annual board meeting, switching from a donation model to what Truesdale calls a “solar concierge,” where the group acts as a resource to connect families with educational resources and companies with which S4OS partners. The modification made S4OS a more service-based model focused on community education. “Instead of purchasing all the systems for everyone, we could connect people who were interested in going solar with resources that are already in place,” she says. This shift allows S4OS to “help a lot more people with a lot less money,” she says. Under the new model, the $15,000 Truesdale would have had to raise through competitions and fundraisers to purchase and install solar panels for one family can now help 100 families gain access to resources and partnerships. In 2015, as a pilot project under the previous model, Solar for Our Superheroes selected its first set of “heroes,” the Rice family of Marblehead, Mass., and is still committed to helping them receive solar panels in the coming months from one of S4OS’s partner companies. For Laura and Tom Rice, a nurse and firefighter, the panels will provide significant savings from high monthly energy costs. The family was nominated for the program by Tom’s fire captain, and after interviewing other community members and discovering the family’s commitment to sustainability, Truesdale decided Tom and Laura were the perfect candidates for the installation. Her vision for Solar for Our Superheroes began when she formed the group in 2013. A year later, she gave a TEDxYouth presentation that expanded on the idea. The S4OS organization didn’t fully take off until Truesdale arrived at Clark a year later. The University has been an invaluable resource for Truesdale while she grows S4OS. She’s taken courses that help her better understand the solar industry and the basic skills necessary to run a business. “I want to study green business, and the interdisciplinary approach of Clark’s global environmental studies major will enable me to acquire the expertise I’ll need by helping me understand how climate change is affecting people, cultures and economics,” she says. She’s also registered Solar for Our Superheroes as a nonprofit — filing paperwork to incorporate and get 501c3 (tax-exempt) status as well as partnering with a solar company and establishing a board of directors. 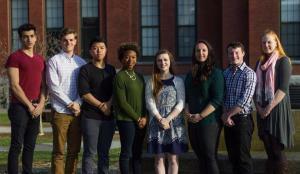 Truesdale’s team has grown from just her and the board to include a staff of eight interns whom she connected with through advertising at Clark’s Entrepreneurship Club Marketsquare event, in-class announcements and by word of mouth. Truesdale witnesses this attitude first hand through her interns, who care about her mission just as much as she does. One intern, William Pew ’16, has wanted to be involved with an organization like S4OS since his first year of high school. “Krissy has identified opportunities, navigated uncertainty and demonstrated flexibility and persistence when faced with challenges,” Whitney says. Truesdale believes her hard work will pay off because she’s doing what she loves — bringing communities together and the electric grid one step closer to being 100 percent renewable. “I love to share what I’ve learned with people,” she says.